The Teddy bear's cuddly soft beige plush fur comforts your little darling. He is an ideal companion for playing and cuddling until your child drifts off to sleep happy and content. 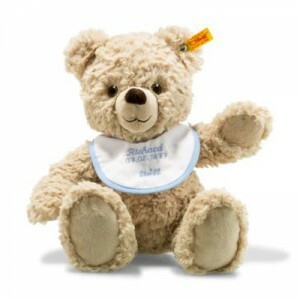 Teddy bears come with a voucher for a pink or blue bib, on request embroidered with the name of your child (max. 12 characters) and the date and time of birth. We can send this to you within 10 working days. A wonderful gift that is remembered for all time. After you purchase this bear send your details for personalisation to Steiff on the card which is attached to the bear. The bib will be posted to you by Steiff within 14 days of receipt of the details required. The bib comes in both Blue and Pink.